Taking inspiration from your top (or from you! ), I can stitch traditional or modern designs on your patchwork quilt. My quilting machine sits on a 10 foot frame, so I can cope with quilts up to 93 inches by any length. I have a range of designs and prices to suit everyone. 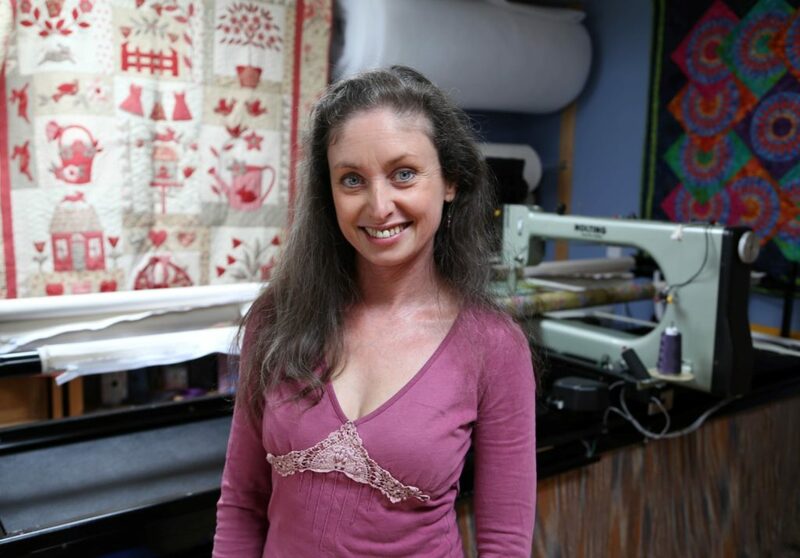 Hi – I’m Lana Dragicevich, and welcome to Bewitching Stitching, the longarm quilting service I have been running for 15 years from my purpose built studio in south west London. I provide a finishing service to quilt makers, turning their pieced tops into professionally finished quilts. I also work with fashion designers and students who are looking for original creations. My studio is equipped with a Nolting longarm machine with “Intelliquilter”, which is a computer driven system. “Longarms” are specialist sewing machines with big throats and a long reach, mounted on a wide frame. Using the Intelliquilter I can digitise complex patterns, or quilt from hundreds of downloadable designs. So whether you are a first timer, or a seasoned pro, I am here to help you complete your project.